Demonstrates how to use FastUniformHeatmapRenderableSeries and create a real-time Heatmap in SciChart for Android. Android Heatmap Charts can be used to visualize a variety of scientific and statistical data. Display a real-time spectrogram (Fourier Transform plus Time) of audio data. To overlay areas of heat on a background image such as a map or image, or to quickly bring to life 2-dimensional data and show the relative intensities via the heat color. In this example you also can tap and drag on the chart to see the animated-zoom performance while the heatmap is updating. 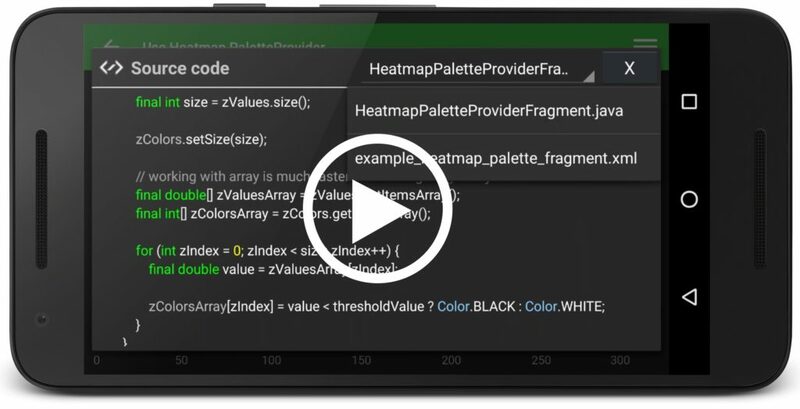 The full source code for the Android Heatmap Chart example is included below (Scroll down! ).